The National Weather Service in Honolulu has issued a wind advisory for the Kohala Mountains and Waimea until 6 p.m. this evening (Nov 28). Winds are forecast to be in the 25-35 mph range with gusts up to 50 mph. 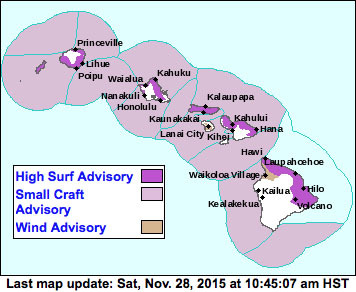 The advisory area includes Waimea and the surrounding area. The National Weather Service in Honolulu has issued a high surf advisory for the north and east facing shores of Hawaii Island until 6 p.m. Sunday (Nov 29). Surf is forecast to be increasing to 10-15 feet by noon today (Nov 28) and 15-20 feet this afternoon. Surf is forecast to be in the 18-24 foot range Sunday (Nov 29). A Small Craft Advisory is in effect until 6 p.m. Sunday (Nov 29) for Kauai northwest, windward and leeward Waters along with the Kauai Channel. Oahu windward and leeward waters along with the Kaiwi Channel. Maui County windward and leeward waters, Maalaea Bay, the Pailolo and Alenuihaha Channels. Hawaii Island leeward and southeast waters.